You have added Chain Gang Belted Wide Leg Pleat Pants in Burgundy into shopping cart. We absolutely love the flattering cut and chain belt detail on these wide leg pants. 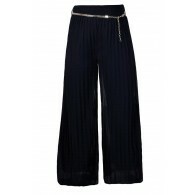 The Chain Gang Belted Wide Leg Pleat Pants have an elasticized waistband with an included metallic chain belt. They are made of a flowy fabric and have a great wide leg cut that pairs well with so many tops and blazers. Vertical according pleats in the fabric add detail. These pants are fully lined for opacity. The Chain Gang Belted Wide Leg Pants look amazing paired with heels, a fitted top, and a blazer. Or wear them with a flirty top for a night out with friends. These pants would be perfect to wear to any upcoming party or event as a great alternative to a dress. They are also cute pants to wear to work for a business casual look. Details: Fully lined. Belt included. 65% silk, 35% polyester. Lining: 100% polyester. Hand wash cold water separately. Color will bleed. No bleach. Hang to dry. Small measurements: Length from top of waist to hemline: 42". Bust: 32". 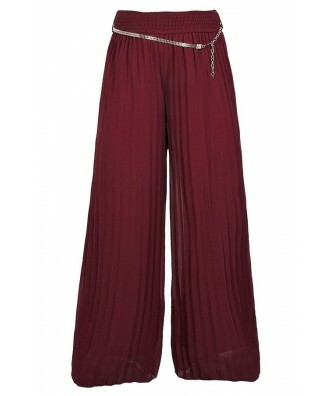 You have added Chain Gang Belted Wide Leg Pleat Pants in Burgundy into Wishlist. 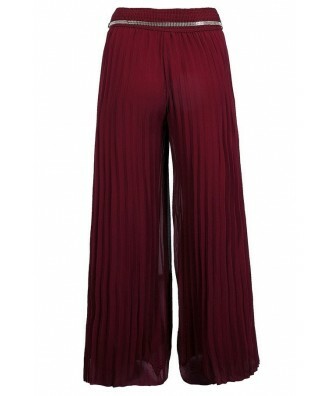 You have added Chain Gang Belted Wide Leg Pleat Pants in Burgundy for Stock Notification. 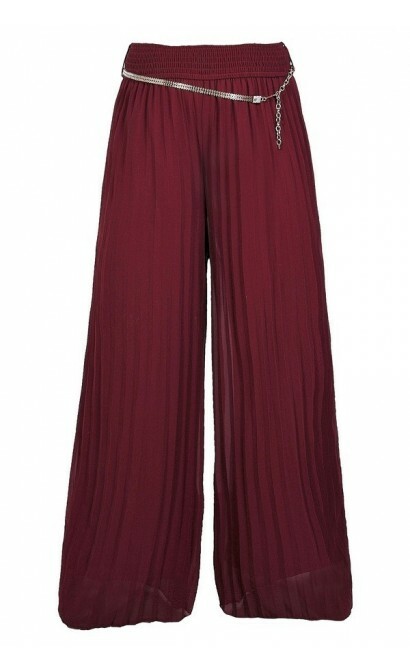 You have set Chain Gang Belted Wide Leg Pleat Pants in Burgundy as a loved product. You have removed Chain Gang Belted Wide Leg Pleat Pants in Burgundy as a loved product.